E is for …. Ear! 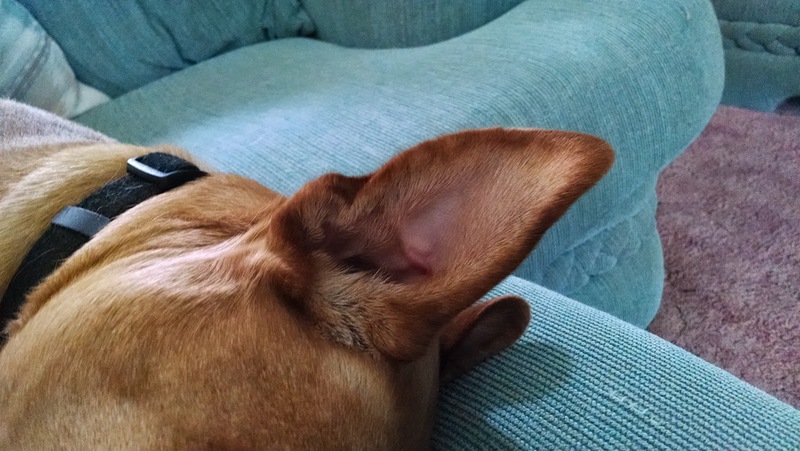 As you might guess from the photo, this post in our alphabetical journey from A to Z is about my dog Annie’s ears. Big, aren’t they? Also prone to infection in this damp climate. But those ears can really hear. Even when she appears to be sleeping while I’m cooking dinner, her ears are cocked, ready for the least sign that there’s something for her to eat. If she hears me gasp and say, “Oh no!” it means I dropped something. Annie to the rescue, hoping it’s meat or cheese and not carrots or cauliflower. She’ll nibble at those and leave the remnants all over the carpet, but a little chicken or cheddar instantly disappears. As I age and my ears age with me, I appreciate how well Annie can hear. She can be sound asleep in my lap, but if a dog barks a half mile away, she’s up and out the door to bark back. Often on our walks, she’ll stop and look and I’ll say, “There’s nothing there.” But a minute later, I’ll see a car or some other people walking or a dog. A few times we’ve seen deer or horses, and once, without Annie, I saw a bear, but I have learned that if the dog suddenly freezes or tugs me in the opposite direction, there’s something there. After all, dogs can detect a much wider range of sound than humans. Their ears have 18 different muscles and move in far more directions than ours can. They are able to hear sounds up to four times as far away. As I mentioned, Annie’s ears are prone to infections. Apparently it’s a common thing with Labs and other dogs with flop-over ears. We have made several trips to the vet to have the ears swabbed out and medicine poured in while three people struggle to hold the dog. I have finally learned how to wash her ears and watch them for signs of infection. If they start looking red and raw, I start putting medicine in. If I do it just before her walk, Annie will almost stand still for her treatment. Sometimes when her ears are red, it has nothing to do with infection. Did you know dogs’ ears turn red when they get excited? It’s like blushing, I guess. E could stand for elephants or excitement or elevators, but this time, E stands for ears. More than 1300 other bloggers have signed up for the challenge. Check out the list at kmdlifeisgood.blogspot.com/p/under-construction.html. You might find some great new blogs to follow. I know I will. Come back to Unleashed in Oregon on Monday to find out what F stands for. Our corgi's ears can discern the difference in plastic bags between chips and cheese and other delicacies he sometimes gets a taste of. Sometimes he'll bark and just faintly we'll hear dogs “miles” away. Definitely hearing seems to be their better sense over us. 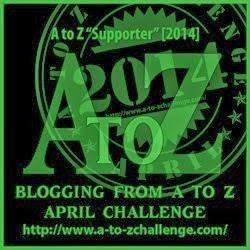 We have more than 2200 bloggers on the list– and it can be found at a-to-zchallenge.com. This pic reminds me of my friend's dachshund. She has the most amazing ears! Damyanti,thanks for correcting me. 2200 bloggers doing a-to-z. This is fun. All the best to you and Annie's ears in Oregon! Happy AtoZing! Great post and something I did not know about Labs so thanks for sharing it with us as we have a new Lab puppy. Next Next post: F is for . . . Fur!